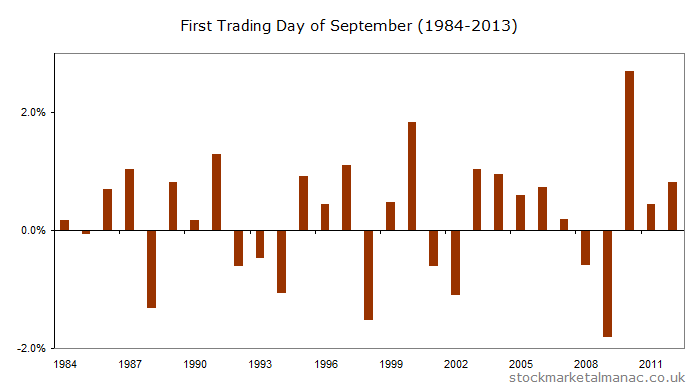 Monday will be the first trading day (FTD) of September. 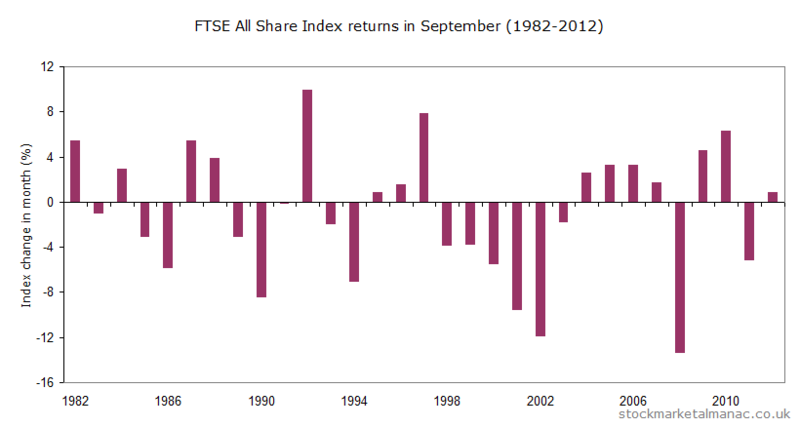 Since 1984, the FTSE 100 Index has risen on average 0.25% on the September FTD – ranking it 5th of all the monthly FTDs. The index has had a positive return on this day in 66% of years since 1984. 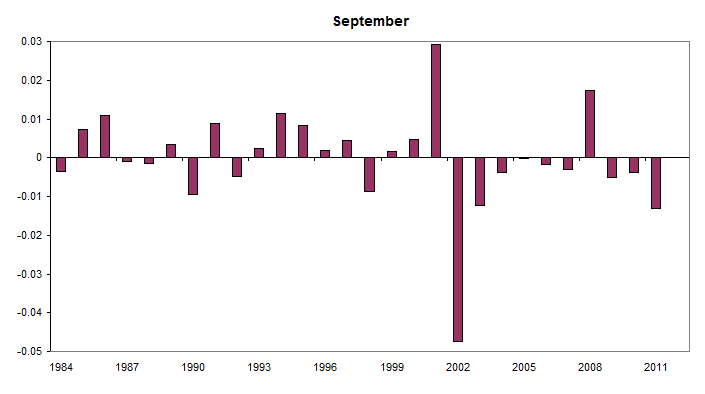 The following chart shows the returns for every September FTD since 1984. It’s triple witching tomorrow (21 Sep 2012)! To add some extra spice to the day there will also be a heavy re-weighting of the S&P indices. And it’s the Autumn Equinox on 22 September. The legendary trader W.D. 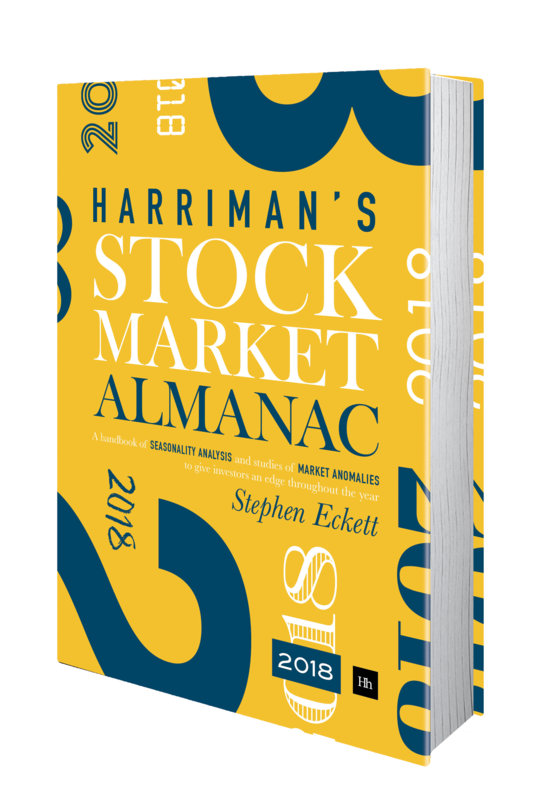 Gann reportedly claimed that capital and commodity markets tend to top on or around September 22nd more oft than on any other day of the year. The lesson of previous triple witching days is to expect increased volatility and an abnormally strong return. 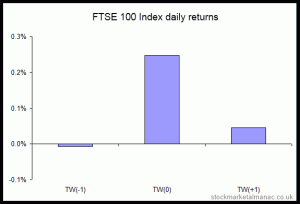 The chart below is taken from the 2013 edition of the Almanac and shows the FTSE 100 Index returns for the three days around triple witching. The two tables below show the 10 ten strongest/weakest shares in the FTSE 100 Index on the eleven September triple witching days since 2000. For example, Capita has increased on the September TW days 10 of the past 11 years with an average return on the day of 0.93.